If you want your sofa to survive your dog, you don't want to let him use it as his personal doggie bed. The American Boston Terrier Rescue advises potential owners to do their research before bringing home a Boston terrier. Boston terriers are notoriously mouthy and tend to enjoy gnawing on anything they can get their teeth on. These dogs also drool quite a lot. If you are the owner of both a nice sofa and a dog who likes to gnaw and chew on said sofa, you are going to have to train your dog to leave your couch alone. Purchase a durable, washable slip cover for your sofa and use it to keep your sofa covered at all times when your dog is loose in your house. 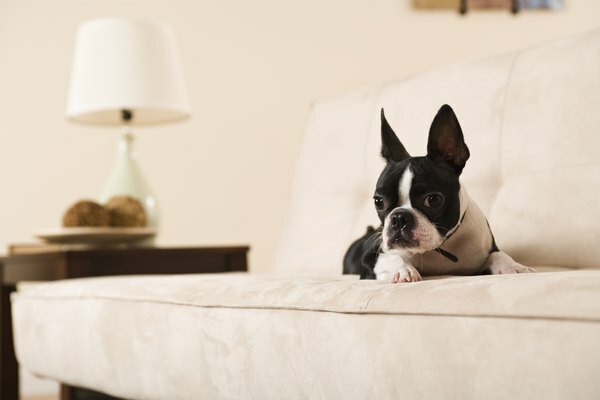 Your slip cover will help protect your sofa from accidents while you are in the process of teaching your Boston terrier to leave the couch alone. If the slip cover gets drooled on, wash it. If it gets chewed open, replace it. Coat both your sofa and your slip cover in a product that deters dogs from wanting to get on your furniture or chew it. Your veterinarian should be able to recommend a good product to use. Keep in mind that many Boston terriers are allergy prone so you will need to read the ingredients carefully and make sure your veterinarian deems it safe. If you do not want to use a spray-on product, you can use a mat that makes noise or delivers a slight shock to the dog when he jumps on the couch. The downside of these products is that they do the same thing to you when you sit on the couch and will have to be moved before you can use your furniture. Do not allow your Boston terrier on the sofa. Not even for five minutes while you are holding him in your lap. Boston terriers can be difficult to train and any confusion you cause by breaking your own rules will make your dog twice as difficult to train as he was before you confused him. Make sure all family members and friends understand the dog is not to be allowed on the couch. When your dog jumps on the couch you need to set him back down, firmly say no and provide him with somewhere else to go, such as a doggie bed on the floor beside the couch. If he attempts to chew the couch, tell him no, take him away from the couch and provide him with a sturdy chew toy to gnaw on instead. Kennel train your dog and keep him in his kennel when you are not able to supervise him. A bored dog may decide to snooze on the couch or chew on it in the middle of the night while everyone else is in bed. Do not allow your dog around the couch without supervision. If you can close the door that leads to the living room or block the room off with a child or pet gate, you may want to do so. Remain consistent in your training over time. It may take awhile for your dog to get the hint that he is absolutely not allowed to touch or chew on the couch. He will catch on as long as you continue to stick with your training. If you want your Boston terrier to respect the couch, then don't let him destroy other pieces of furniture either. He will not understand the difference.